There's a website I'm fond of, called Good Old Games, where their remit is to sell good old PC games at a low cost, and with no DRM at all. It's a worthy aim, and I've availed myself of their services a few times so far. This weekend, they've got a promo offer on their racing games. One of the games is Screamer, which is a game I'd heard the name of but never seen or played. After a brief canvassing of opinions, I decided that £3.50 was not too much to pay. One download and setup later, and I was off. Oh boy, was I off! Screamer is very much a game of its time, an arcade game of the era built for the PC. 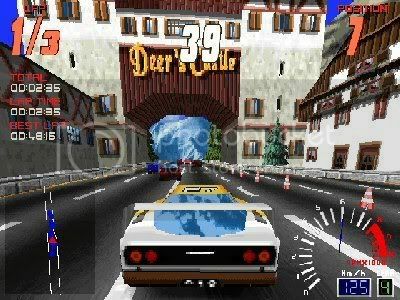 Someone told me it was the PC Sega Rally of its day... I think it may be a bit of a cross between that and Daytona, although it brought to mind the recent OutRun games whilst playing it, although obviously they came much later. There's not a lot of depth to Screamer... choose a car, pick a track and race. You can race a championship if you like... there's yer depth. In fact, it's so arcadey that your only controls are up, down, left and right, plus gear changes up or down if you use manual transmission. It's quite a joy to play something as simple and unpretentious. Screamer is loud, fast, brash and above all, fun. Even the noisy commentator is kind of endearing in his own "special" way. For a little over the cost of a pint, this has proven to be well worth the time and money.